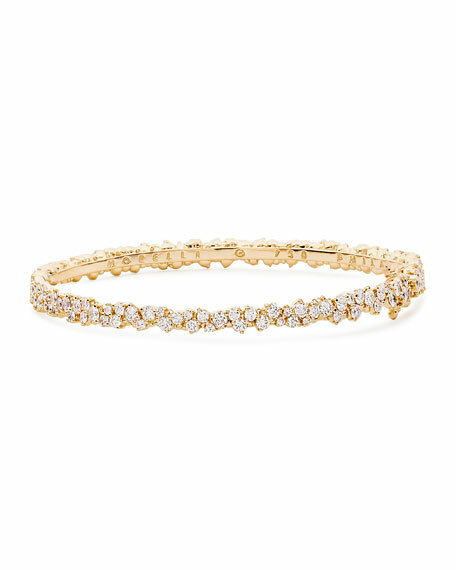 Paul Morelli bangle bracelet, from the Confetti collection. 3.24 total diamond carat weight. There's something very dramatic about Paul Morelli's handcrafted pieces. Perhaps it's because the family business (founded in the early 20th century) began as an atelier for custom, one-of-a-kind theater costumes. In the late 70s, Paul Morelli took his place at the helm and (following his passion for art, precious stones, and metallurgy) steered the company's course into the world of fine jewelry. To this day, his workshop remains in the same building in Philadelphia as the family's first costume shop. There, Morelli and his team of artisans create each piece of jewelry from an original cast and finish them one at a time by hand. For in-store inquiries, use sku #910087.